Replanting will be completed by 2017 and monitoring to continue until 2018. Yayasan Sime Darby (YSD) Chairman Tun Musa Hitam (second from left) and Sabah Forestry Department Director Datuk Sam Mannan (third from left) viewing Orangutan nests on the trees planted since 2009 under YSD’s reforestation of Orangutan habitat in the Bukit Piton Forest Reserve. LAHAT DATU, 6 December 2016 – An Orangutan is nestled in a bed of evergreen leaves up on a “ketapang” tree in the Northern Ulu Segama Forest Reserve. A few metres away, up on another tree, a recent Orangutan nest is clearly visible. Ten years ago, this scenario would have been a rare occurrence, but now, thanks to an initiative to rehabilitate the heavily degraded forest, frequent sightings of Orangutan have been reported. The rehabilitation project in the Bukit Piton Forest Reserve, which has a total area of 11,612ha, is part of the Sabah state government’s Ulu Segama-Malua Sustainable Forest Management project established on 15 March 2006 covering a total area of 241,098ha. The Northern Ulu Segama Orangutan habitat reforestation initiative began in 2008 through a collaborative partnership between Sime Darby Plantation Sdn Bhd (SDP) and the Sabah Forestry Department (SFD). In 2010, Yayasan Sime Darby (YSD) was roped in to facilitate and accelerate the achievement of the project’s target. YSD committed RM25 million over 10 years to reforest about 5,400ha of the forest reserve areas which will be completed by next year. The SFD, with the assistance of YSD and SDP, will continue to monitor the project until end of 2018 to ensure that the planted trees are in optimum condition for growth in order to create a vital, healthy habitat for the Orangutan. A habitat once ravaged by forest fires and acute timber harvesting practices, the northern Ulu Segama Forest Reserve, also known as the Bukit Piton Forest Reserve, is now slowly experiencing the presence of Orangutan population in the area. YSD Chairman Tun Musa Hitam said the Ulu Segama forests are an integral area in conservation efforts as it is home to arguably the largest population of Orangutans in Sabah – some 3,500 to 4,000 individuals, or 30% of Sabah’s estimated Orangutan population. Encouraged by YSD’s success in rehabilitating the Bukit Piton Forest Reserve, Tun Musa urged other corporations to do their bit for the environment especially reforestation of degraded forest areas. “I would like to call upon other corporations to come forward and emulate what YSD has done in Bukit Piton. “Since 2009, the foundation has committed more than RM83 million for environmental conservation projects in Sabah alone, including RM25 million for this project. I would like to extend my deepest appreciation to SDP and SFD, who have rendered their experience and expertise to ensure the success of this project. “This is my first visit to the Bukit Piton Forest Reserve and I am pleased to see that the project has borne fruit, and we have achieved what we had set out to do, that is to provide trees including fruiting trees for the Orangutan population and other species to thrive in this forest. “YSD’s effort to support the rehabilitation of this important habitat for Orangutan individuals underlines the Foundation’s commitment to protect and conserve valuable habitats of critically endangered species by the rehabilitation and preservation of forest reserves and other pivotal yet fragile ecosystems,” he said. YSD’s support for the reforestation project in Ulu Segama had assisted the SFD to successfully advocate for the reclassification of the Northern Ulu Segama Forest Reserve to a Class 1 Protection Forest Reserve or Totally Protected Area status in 2012, from its original status as Class 2 Commercial Forest Reserve. Under the law, the reclassification protects the area from potential encroachment or development activities, as it is not allowed to be used or converted for other land use purposes. The project has also supported the communities living along Sungai Segama who have been engaged and provided job opportunities related to reforestation works. SFD director Datuk Sam Mannan commended YSD for its efforts to rehabilitate degraded areas in the Bukit Piton Forest Reserve. “This project has benefitted not only the Orangutan and other wildlife but also the Segama community who were provided with alternative job opportunities. The project also helped educate the villagers with a deeper understanding and respecting the environment. “This initiative is an example of how corporate-led initiatives have the ability to assist governmental efforts and make indelible positive changes to foster wildlife and the preservation of the environment for the benefit of society-at-large. On behalf of the State Government of Sabah, I congratulate YSD for, arguably, the world’s first fully restored Orangutan habitat.” he said. Since 2009, YSD has committed RM129 million towards the protection of high conservation value ecosystems, vulnerable and endangered species as well as initiatives promoting the preservation of the environment and biodiversity. Sabah Forestry Department Director Datuk Sam Mannan (left) assists Yayasan Sime Darby (YSD) Chairman Tun Musa Hitam (right) to plant a tree sapling at the Bukit Piton Forest Reserve. YSD has committed RM25 million over a period of 10 years to the reforestation of 5,400ha of degraded Orangutan habitats in the Bukit Piton Forest Reserve, which will see planting completed in 2017 and monitoring to continue until end of 2018. 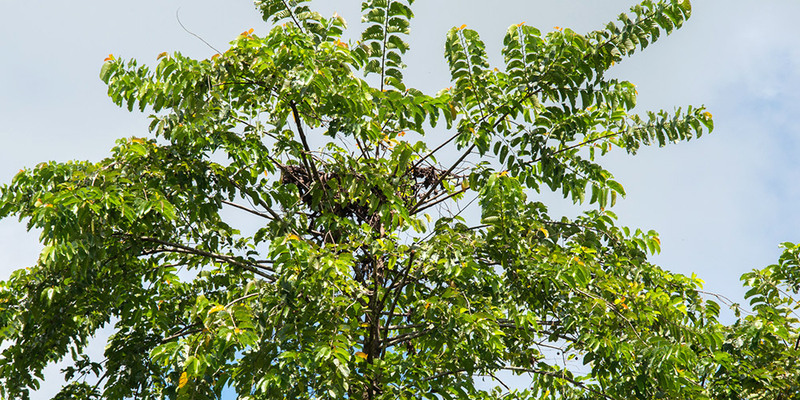 An Orangutan nest seen on a tree planted by Yayasan Sime Darby (YSD) at the Bukit Piton Forest Reserve in 2009. More Orangutans have been sighted in recent years in the area where YSD committed RM25 million over a period of 10 years to reforest. 5,400ha of degraded Orangutan habitats in the Bukit Piton Forest Reserve have been planted with trees. The planting will be completed in 2017 and monitoring will continue until end of 2018.